I know that GMA Channel 7 has no exclusive rights on what should be on the station. 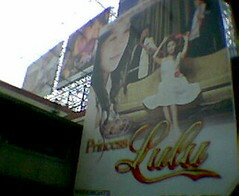 But I just find it hilarious to see lots of billboards of ABS CBN Channel 2 shows there. The network wars are terrible enough as it is, and even on the train stations, it looks like it. not just some. All billboards on the GMA Train station are ABS-CBN-related. Exagg! I should check that out sometime. LOL. You should check both north and south sides. They have it plastered. Hmmm. If GMA would claim the MRT – di kaya exaggerated na talaga yun? Lol, Clair. One can barely see the station overpass at all. All I saw were the billboards. Ha! … to think that majority of those who ride the MRT are part of the working force who don’t get to watch the two stations’ shows. masa ang target market nila, the ones who don’t have anything to do the whole day except wake up, eat, stroll the malls not buying anything, watch tv and sometimes join rallies for money and food, so they should have them on malls, instead. It was a fun time pointing this bit of information to my family when we passed the station last Friday! LOL. Exagg, they should lessen the number of billboards there. Ad overload!!! CharlieSolisPH: Then again, there are a lot of people who ride buses. Kayang daanan yung ads – so kita talaga ng masa.